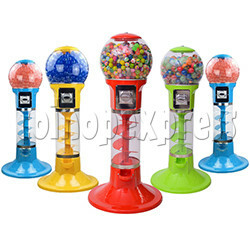 43 Inch Spiral Capsule Vending Machine is a novel round and transparent globe type coin-operated toy capsule machine. The upper part of the machine design a transparent round capsule box for place the twisted capsules or stretch balls, the lower part of the machine design a interesting spiral path for the gift down, the shape choosiness beauty. This machine is made of ABS and PC, with good impact resistance, heat resistance and low temperature resistance. Capsule box can place different sizes of twisted eggs or elastic balls from 23-55 mm, the capacity of the case can hold about 1000pcs elastic balls of 32mm size, or about 260pcs twisted eggs of 50mm size. Simple and fun to operate, insert coins, and turn the knob clockwise, a gift fall down the spiral path, and take the gift from the exit.